As well acting classes, GFCA offers a range of specific subjects useful for people to start or continue to develop their acting skills, in a supportive yet exciting environment! 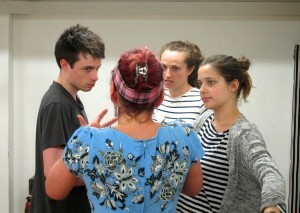 Please also check out the Acting Classes page. On Camera demystifies the relationship with the camera, providing essential technique and giving attention to the detail, fluency of thought, emotional and physical life required in acting for film and television. Classes cover the day-to-day realities of filming – framing, timing, hitting your mark, the constraints of continuity as well as the transmission of a character’s inner life with and without words, all the while engaging intimately with the camera. A typical class involves targeted exercises, exploration of preparation-techniques and analysis/interpretation, but practice with the camera is central, through work on monologues or scenes. The class reviews the work, and develops through a dynamic process of observation, practice and reflection. 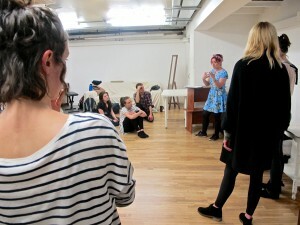 The class is designed for those who have already developed some acting technique. 10-session course, offered April to June, Weekday evening. This class is designed to help you approach working without a script, and to experience the immediacy of the work of the actor, using intuition and the power of the imagination. The course covers essential principles for improvisation based on the inspirational work of Keith Johnstone and Viola Spolin. Classes start with a physical warm-up created to free the body and mind, and are structured through a variety of games, team-building exercises, scene work and devising which allows you to find your spontaneity and inspiration without interference. The class is encouraged to experiment with creativity, narrative and storytelling. Approaching a scene with the absence of blocks and judgement and truly experiencing the world moment by moment is what gives a scene truth and dramatic strength. Develop the confidence to be truly in the moment and embrace the stage as a blank canvas, to co-create new living performances. The awareness, openness and understanding of the needs of the scene that improvisation skills can bring are invaluable goals for any actor. Taught by Jane Colenutt and Dave Bourn. Weekday evening 7.30 – 9:30 pm. 10-session course, offered in October and January. This course takes the students through the building blocks of the Meisner Technique. The tutor’s approach to these sessions aims to empower the actor, helping them to play to their strengths, to find the raw truth as the backbone of their work and to stay present and alive on both stage and screen. Each week we seek to move the work to a deeper level, hanging most sessions on Meisner’s famous repetition exercise. It is an intense course, allowing actors to get to know themselves, to better aid them in their pursuit of truthful acting. Meisner was one of the original members of the Group Theater along with Lee Strasberg, Stella Adler, and Harold Clurman until it disbanded in 1941. Afterwards, Meisner led the acting department of the Neighbourhood Playhouse School of Theater in Manhattan for nearly half a century. Among Meisner’s students were Robert Duvall, David Mamet, Jon Voight, Diane Keaton, Lee Grant, Gregory Peck, Grace Kelly, Sydney Pollack, and Steve McQueen. Meisner’s technique is based on Constantin Stanislavski’s method of acting, however a core difference is the shift from emotional recollection to the uncensored and truthful response to the moment as the emotional instigator. This allows for far more freedom and the ability to take on vastly varied circumstances. Meisner considered his technique to be a non-intellectual approach to truthful acting: the technique enables actors to pursue a deeper and far more intense exploration of the truth of each moment. The essence of Meisner is living truthfully, moment to moment, under the given circumstances. The foundation of this work sits in varying stages of the repetition exercises. Over time we move into ‘breaking the back’ (ie script-work), plus improvisational exercises, relationship work, preparations, and independent activities. Taught by Dannie Lu Carr. Weekly evening class 6:30-9pm. *We offer the Meisner 30-week progression course, October to July in 3 terms of 10-sessions, for those wanting an extensive training in Meisner. All great movies start with great scripts! The practical side of the work – software, research, collaboration, and getting work produced in a saturated market – is also addressed. Evangelo Kioussis worked in the Canadian film industry for over 15 years, where he wrote and directed for Global Television, CBC and Vision TV. Now living in London, he consults for a large and diverse number of writers and production companies, while developing and producing projects with his partners at Mirror Productions. We develop ways of relating from the moment of birth, both to ourselves and others. This creates a sense of self shaped by family, society and our own strategies for survival. Often this feels fine when expression flows, but sometimes seems to hinder an inner sense of self struggling for expression. For actors this can be used in shaping characterisation, but can equally feel restricting at times if not fully understood or recognised. Meeting as a group for 8 consecutive sessions, we explore in a safe, contained environment the mystery of ourselves through group faciliation; group member feedback; and also by paying personal attention to our bodymind experience. The group is led by Xanthe Parkin, a UKCP registered Integrative Body Psychotherapist who has a deep interest in what it means to be embodied. She has a BA in English and Drama.